Planted freshwater aquariums can be incredibly beautiful if done properly. They require a bit more technical knowledge than beginner aquariums, but are well worth the extra effort. One of the most important parts of running a planted aquarium is picking out a high quality LED light. In this all-inclusive guide, we will review the top six best LED lights for planted tanks and help you make the best decision possible! 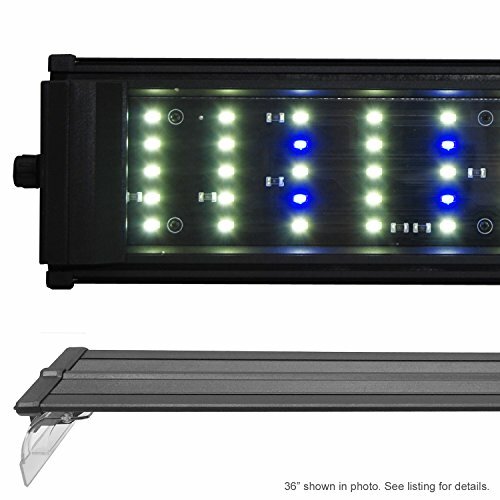 The Finnex Ray2 is an affordable, high output planted aquarium light known for its raw power. This light can handle just about any aquatic plant under the sun. 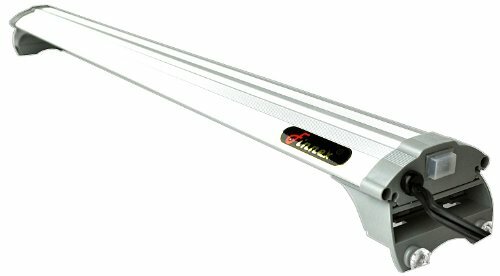 When it comes to planted aquarium lighting, the Finnex Ray2 is one of the most popular choices on the market. Available in just about every size under the sun, every planted aquarium owner is sure to find a Ray2 suitable for their tank dimensions. Based on my experience, the Finnex Ray2 is best suited for those who plan to keep light-intensive plants. The Ray2 is Finnex’s brightest lights (definitely brighter than their FugeRay and Planted+ models), so it’s a great option if you ever want to keep demanding species such as Dwarf Baby Tears. This should also go without saying, but the build quality and longevity of the Ray2 is top notch. Its low profile frame allows for a somewhat minimalist look and you should easily be able to 3+ year of great use out of this LED light. A quick note: Like we touched on before, the Ray2 is a very high output light. If you’ve never kept planted aquariums before (or aren’t familiar with water parameters, you might notice a lot of algae growth. If you’re keeping demanding plants and dose CO2, this is the light for you…if you are just looking to keep a few easy species, you might want to check out a few of our other picks. Doesn’t contain any red or blue lights – if you’re only keeping green plants, this light will color them up well. If you keep other color plants, color might diminish over time. Overall Assessment: The Finnex Ray2 is great for those who want to keep plant species that demand high levels of light. The Current USA Satellite Plus Pro is another high-end planted aquarium light known for its endless options and features. It is packed with power and can sustain even the most difficult plants. If you’ve done any other research on planted aquarium lights, I’m sure you have heard of the Current USA Satellite LED Plus. The Satellite Plus is a favorite among planted aquarium enthusiasts because of its intensity, customization options, and unique features. When it comes to PAR reading and lighting intensity, this unit definitely top of the line. It’s not as bright as the Ray2 features above, but that isn’t necessarily a bad thing (especially if you’re keeping low-light plants). That said, the LED Plus should be able to sustain 99% of the plant options out there. The real shining feature of the Satellite LED Plus is the customization options. The wire controller allows you to adjust light intensity and even mess around with the colors (depending on what your plants like). In addition, this unit comes pre-programmed with several unique settings that simulate natural weather conditions such as cloud cover and storms (as cool as these are, though, I couldn’t see myself using them often). Finally, the last huge benefit of the Satellite Plus Pro is the ramping feature. The ramp timer starts out the day with a dim light (simulating sunrise), which gradually increases in intensity throughout the day. The ramping feature creates a more natural environment and helps reduce stress in fish and plants. Overall Assessment: The Current USA Satellite Plus Pro is great for those that want a mixture of power and customization options. The Beamswork DA 6500k LED is a no-brainer for those on a budget. This cheap planted aquarium light can sustain low to mid level plants while boasting an extremely affordable price. 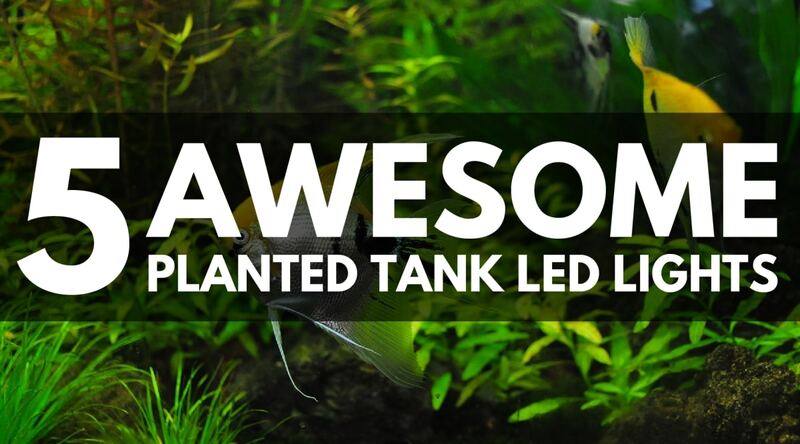 The Beamswork DA 6500K is another great LED light for planted tanks. Although it’s not the most powerful option on our list, it’s definitely an effective and low cost option for those that keep less demanding species. Let me get this out there…I absolutely love this Beamswork fixture – it’s affordable, reliable, and capably of supporting low to mid level plants. That said, it’s probably not the best option if you plan to keep ultra demanding plants. For 90% of planted aquarium owners, though, this unit is a great option (especially for first timers looking to save a little money!). Besides its affordability, the Beamswork DA 6500K also includes a built in programmable timer. I have to say, I was a little surprised by this at first – generally, timers are reserved for more expensive fixtures. 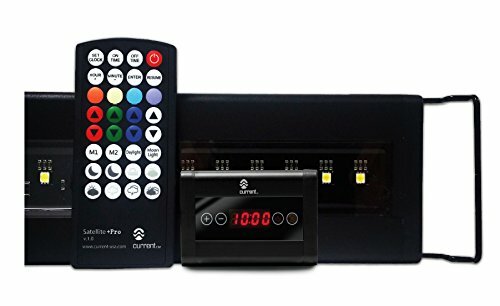 The timer allows you to set a time for your lights to automatically turn on and off, essentially making this unit “set and forget”. Built in programmable timer – no longer will you have to remember to turn on the tank lights every day! Overall Assessment: The Beamswork DA 6500K is perfect for those one a budget. The Finnex FugeRay utilizes red and blue LEDs to bring out the natural color of aquatic plants, making it a great choice for those looking to spruce up their tank. Its no secret that Finnex makes amazing freshwater LED lights. If you recall, we covered a differed Finnex fixture earlier in this article. Because a lot of the features of the Ray2 and the FugeRay are similar, we are going to tell you how these two differ. First of all, the Finnex FugeRay contains red and blue LEDs, while the Ray2 does not. The lack of red and blue bulbs in the Ray2 sometime cause colors to look “washed out” or dull – with the FugeRay, this is definitely not an issue. The FugeRay’s use of both red and blue LEDs helps plant colors “pop” and appear more vivid, especially among red plants in particular. Aquarists who prioritize color over growth will probably enjoy the FugeRay more so than the Ray2. Despite the FugeRays use of additional red and blue LED bulbs, it does appear a bit dimmer than the Ray2 (this isn’t surprising, though – as we talked about before, the Ray2 is extremely bright). Depending on your preferences and the types of plants you plan to keep, this can either be a good or bad thing. Overall Assessment: The Finnex FugeRay is great for those that want to bring out the natural colors in their planted aquarium. TheFinnex Planted+ 24/7 LED is a feature-rich planted aquarium light that allows plant keepers to automate their entire lighting schedule. Surprise, surprise, another Finnex made the list! In all seriousness, you really can’t go wrong with a Finnex light for your planted tank. The Finnex Planted+ takes a unique approach at planted aquariums, providing a much more enjoyable user experience than other lights on the market. One of the ways that the Finnex Planted+ does this is by simulating a complete, natural sunrise and sunset. All of this is hands free and programmed into the controller. The real shining feature of the Planted+ is the 24/7 feature. This feature requires no maintenance and is completely hands-off. This setting begins with a soft dawn that eventually progresses into a warm lit sunrise. Following the sunrise comes the peak of the cycle, which simulates high noon in nature. High noon transforms into a soft red sunset, and eventually, night. This complete 24/7 feature allows the user to experience a full day cycle with practically no upkeep. In addition to the 24/7 feature, the Planted+ has programmed settings that replicate storms, cloudy days, and starry nights. All of these settings are available with a simple click of a button (although, one again, I never actually use these features – they are cool, but don’t serve much benefit). Overall, the Planted+ is a user-friendly light that is great for planted aquarium owners that like the finer features in a light. Fully hands off and user friendly. the 24/7 feature is very enjoyable to use! Overall Assessment: The Finnex Planted+ is perfect for those that want to automate their lighting schedule. Why Are LEDs Perfect for Planted Aquariums? 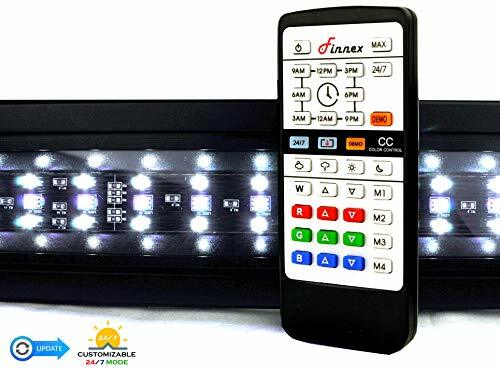 LED lights are usually extremely easy to set up and install. Years ago, metal halide and T5 fixtures required constant tinkering and adjustments. LEDs, on the other hand, are generally “set and forget”. One you plug them in, you’re good to go. the lifespan of LED light fixtures is something that I would have killed for 10 years ago (curse those cheap PC lights that I needed to replace very 6 months). A good LED fixture like the ones listed above can easily last you 5-7 years, if not more. Metal halide, t5, and pc lights were all the rage a few years ago. That said, they all share one common fatal flaw – they burn extremely hot. This extra heat put off by the light fixture can raise water temperatures and cause sudden fluctuations. LEDs, on the other hand, put of virtually no heat. Cheaper electricity costs and a more stable tank…need I say more? LED planted aquarium lights are considerable smaller than other types of fixtures. The Kessil Tuna Sun, for example, is extremely compact when compared to bulkier metal halide or t5 fixtures. A smaller light means a more streamlined, enjoyable tank! The last (and most important) reason that LED fixtures are the best option for planted tanks is because they facilitate better growth. The rise of LED fixtures is recent years has made is possible for anyone to keep high-light plants – something that was difficult and expensive just a few years ago! If I had to pick the best LED light for planted tanks, I would probably go with the Finnex Ray2. It definitely provides the highest light output and is sufficient for even high-demanding plants. With the Finnex Ray2, you wont be limited by your light. Overall, it provides the best value, power, flexibility for your money. That being said, some of the other options of the list may bring out better colors in your plants. If you your tank is stocked with red plants, the Finnex FugeRay might be a better option. The red and blue bulbs in the FugeRay enhance plant colors and encourage stronger growth in low-demanding plants. Lastly, if you are looking for a hands-off light that you can set and forget, the Finnex Planted+ 24/7 LED Light is, without a doubt, your best option. It has tons of cool features that will provide endless entertainment! Overall, choosing the right LED light for your planted aquarium really depends on your needs. We can promise, though, that any light fixture reviewed on our list will not disappoint!